CHESTER, Pa., June 9, 2018 /PRNewswire/ --Chester Mayor Thaddeus Kirkland today presented a stirring charge to 220 eighth-grade graduates of the Chester Community Charter School (CCCS), at the school's commencement ceremony at Neumann University's Mirenda Center, 501 Convent Road, Aston, PA.
At two separate morning and afternoon events for the School's Aston and East D campuses, Mayor Kirkland addressed approximately 1400 students, family members, teachers, community leaders and well-wishers. More than 1400 students, family members friends and we’ll-wishers attended Chester Community Charter School’s eighth-grade graduation ceremonies, at Neumann University, in Aston, PA.
Hon. 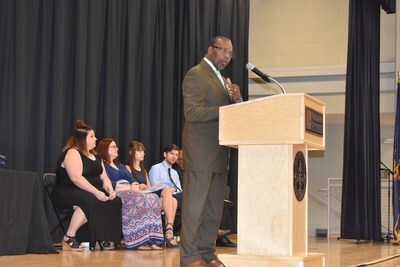 Thaddeus Kirkland, mayor, city of Chester presented Chester Community Charter School’s commencement addresses to 220 eighth-grade graduates, at Neumann University. The Mayor’s message: It’s time for the grads to move beyond just talking about their future success and to start “being about” such success, every day. 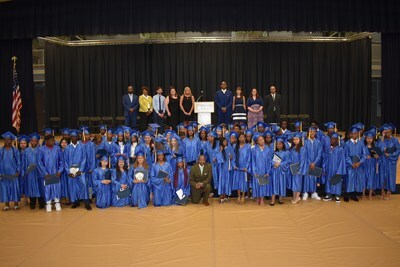 Chester Mayor Thaddeus Kirkland (front row, center) shown with eighth-grade graduates of Chester Community Charter School, at commencement ceremonies held at Neumann University, after presenting the commencement address to the students. Also shown, at top, are school administrators and faculty members, including Dr. David Clark, chief education officer(far left); Dr. Linda Portlock (second from left), deputy superintendent; and Terrane Polnitz, Aston Campus Principal(fourth from right). The mayor's key theme, that commencement day is the time to move beyond talking and dreaming about having a successful future, and to start "being about" that success, in everything you do seemed to resonate with the graduates and with others in attendance. Other speakers at the Aston Campus commencement event included CCCS Chief Education Officer Dr. David Clark; Aston Campus Principal Mr. Terrane Polnitz, and Ms. Aaliyah Campbell and Ms. Olivia Coulanges, the Aston valedictorian and salutatorian, respectively, for the class of 2018. Speakers at the East D Campus commencement included East D Principal Ms. Sharon Watkins; Tahkel Richardson, a distinguished CCCS alumnus; Ms. Halle Griffin, the campus's valedictorian and Ms. Charnae Berry-Coleman, the campus's salutatorian. 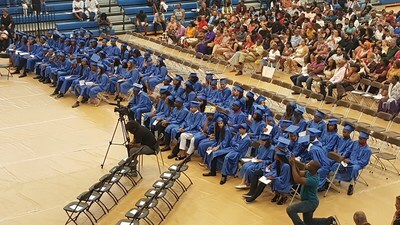 During the commencement programs, the school also announced that 11 academic scholarships to prestigious private high schools had been awarded to: Gary Acuna, Kethzy Baez-Muniz, Charnae Berry Coleman, Katelynn Goodwin and Tymir Jackson, who will attend Cardinal O'Hara High School; Tahmaj Lawler-Powell, who will attend St. Elizabeth's High School; Kiara DeWilliams, who will attend Bonner and Prendergast Catholic High School; Olivia Coulanges, who will attend Neumann Goretti High School; and Jihan Bailey and Katie Acuna-Martinez will attend Archmere Academy, in Claymont, Delaware and Aaliyah Campbell will attend the Tatnall School, in Wilmington, Delaware. The scholarship program is coordinated by CCCS's High School Search and Selection Program, and most of the scholarship funds, as has been the case since 2006, are contributed directly by the Gureghian Charitable Foundation. Aside from the private-school scholarship winners, the majority of the school's graduates will pursue their high school diplomas at Chester High School, and other regional public schools, and 53 of this year's graduates have applied for acceptance to Chester's STEM Academy at Showalter. Commenting on the next steps for the school's graduates, Chester Community Charter School CEO Dr. David Clark said: "I am confident that our students are well prepared to excel academically, once they receive their CCCS diplomas, whether they were fortunate enough to win a scholarship, here, or not. We are committed to 'empowering all of our students as learners,' a lesson we encourage them to take with them, through additional academic studies, and beyond, for the rest of their lives." Chester Community Charter School (CCCS) opened its doors on September 9, 1998, serving 97 students from its modest, four, meeting rooms in the lobby of the Howard Johnson Hotel, in Chester, PA. Since that time, the school has steadily grown to include more than 4200 students in 12 state-of-the-art buildings, spanning four campuses. It is now the largest brick-and-mortar charter school in the Commonwealth of Pennsylvania. In fact, when CCCS opened its first permanent structure in 2001, it was also the first new school building constructed in Chester-Upland, since 1975. By comparison, the average age of a school building owned by the Chester-Upland School District is 64 years. Through collaboration with the Gureghian Charitable Foundation, and CCCS's High School Search and Selection Program, more than $10 million in scholarships and financial assistance to prestigious private secondary schools has been awarded to 350 of the school's graduates.